sweetiesgirl, your lil angel is darling! the hat looks so cute on him! Thank you so much for sharing your pattern! I totally need to make one! Oh, what a great hat!! I will have to try this out since my DD is expecting my first grandchild in August- a boy!!! I'll probably make it in navy/white to represent the NY Yankees!!! made this for niece's baby shower. was a hit! 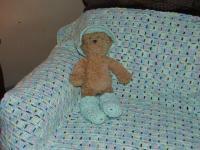 Here is a pic of the one I made in cotton.....friends having their first child and it is a boy! Although heck this is cute for a girl too! Thanks again for the pattern! Also made one for my 6 year old DD to wear and she loves it! I made one of these for a friend who is due with her third boy in late May and it is SO adorable! 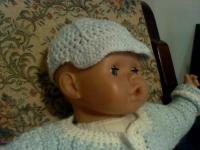 My daughter's Bitty Baby is wearing it for the time being...I hope she won't mind giving it up! Thanks for sharing this. I cant wait to make one. Adorable! Thanks for sharing! This is going on my project list. 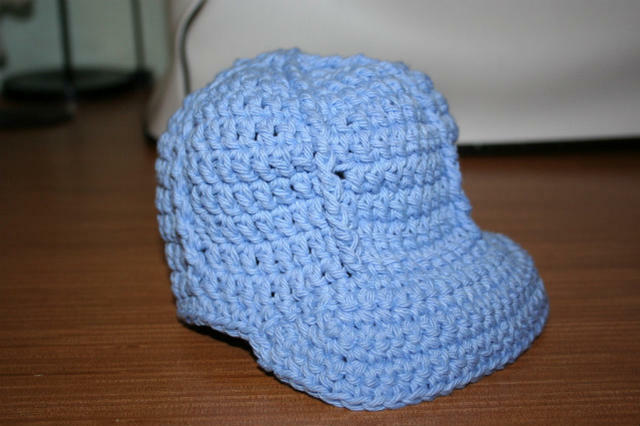 This is so cute, and my cousin wants a beanie with a visor for her baby boy due in December. You said that you made it with baby yarn as well, what changes did you make to do that? I love baby yarn. Did the brim still stand up with the softer yarn? Thank you so much for sharing your pattern! My brother in law thought his son looked adorable in his new ballcap and Mom was thrilled also! 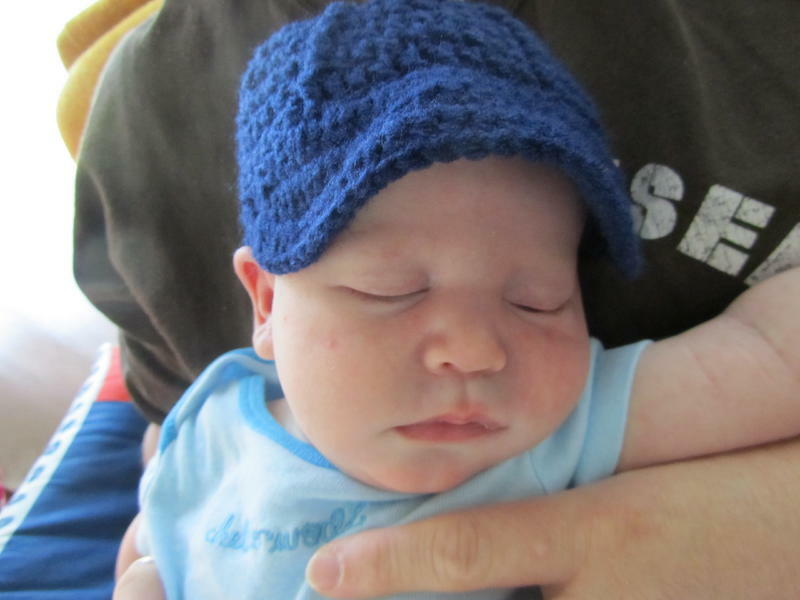 I have attached a photo of Connor in his ballcap - he was celebrating his one month birthday! His mom says so far the hat doesn't bother him and he leaves it on. Once again thank you for sharing your pattern it was so easy to follow and I loved the way it turned out!! Lovely.!!!!! I've made a few already and gave them to babies that I love. I have have been getting requests to make them for older babies. I was wonder how many stitches I would to increase to make it for a 9 month old. Do you have the pattern for bigger babies? Please let me know. Soooo adorable. Can’t wait to try it out. I made one of these last night! So cute and so easy. I wish the site would let me post pictures! Thanks for sharing the pattern!!! Love this! I have a friend that is pregnant with a little boy. I might have to add this to the list of things I want to make her! Made this for my for my first grandson due in July. Adorable! Thank you for sharing your pattern with us. Take care and be safe. Very cute! Thank you for sharing the pattern. Finishing up this sweater, and then I am DEFINITELY making this for my cousin's baby, who's due to arrive in June =D Thanks so much!